It’s a short season. They’re only really available at the tail end of August. And I can see why people are obsessed. Festivals and cooking competitions span New Mexico and beyond as fans of Hatch’s heat put them in everything from quesadillas to key lime pie. 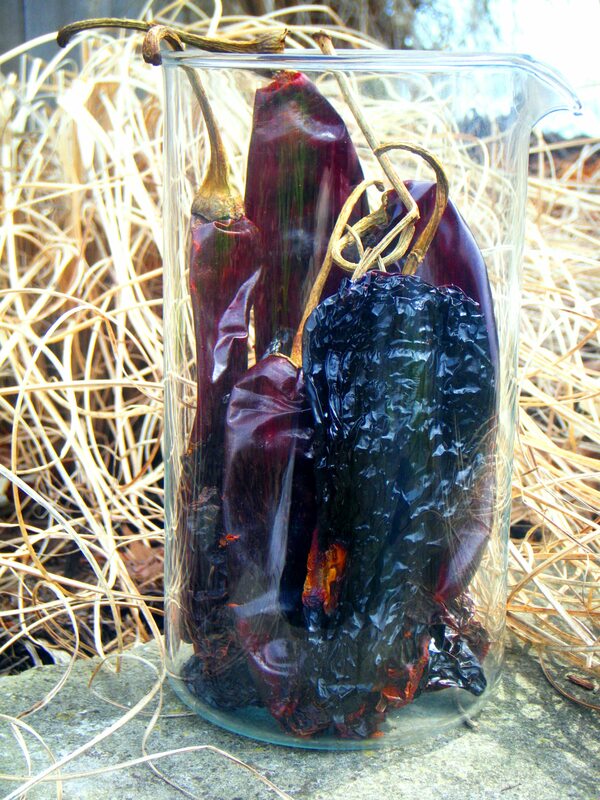 Hatch chiles are meaty, flavorful green chiles with a skin that slips off easily after a deep roast over my stove’s gas burner cranked to high, and a quick steam in a bowl covered with cling film. They freeze wonderfully well if you take care to roast them and remove the skins before you freeze them. One word of warning: they get hotter the longer you freeze them. I bought a pound of chiles and roasted some for a batch of chili. After roasting and removing the skin and seeds, I pureed them with a few rehydrated dried chiles for some smoky depth. I ended up with quite a nomad’s version of chili. There are several tricks to great chili, the first being you should probably work to develop your own house style. Start with a recipe that you love. Use better than average meat: thinly sliced sirloin, cut into short ribbons works worlds away better than basic ground round. Deeply browned meat and softened onions provide a good flavor base for the chiles and spices. You are by no means stuck with beef: lamb and buffalo are great options as well. Use a combination of chiles for the best flavor. Today I soaked pasilla, ancho and chipotle chiles and blended these with the fresh roasted hatch and a little water for my own chile paste. Extra paste freezes really well in ice cube trays. In terms of spicing, think beyond chile powder and cumin to possibly include black cardamom pod (adds a great note of smokiness), a bit of paprika, tiny amounts of cinnamon and cloves, a sprinkling of ground coffee, a drizzle of molasses, apple cider or rice vinegar for balance. Adding these seemingly exotic spices only deepens the complexities of the chili. 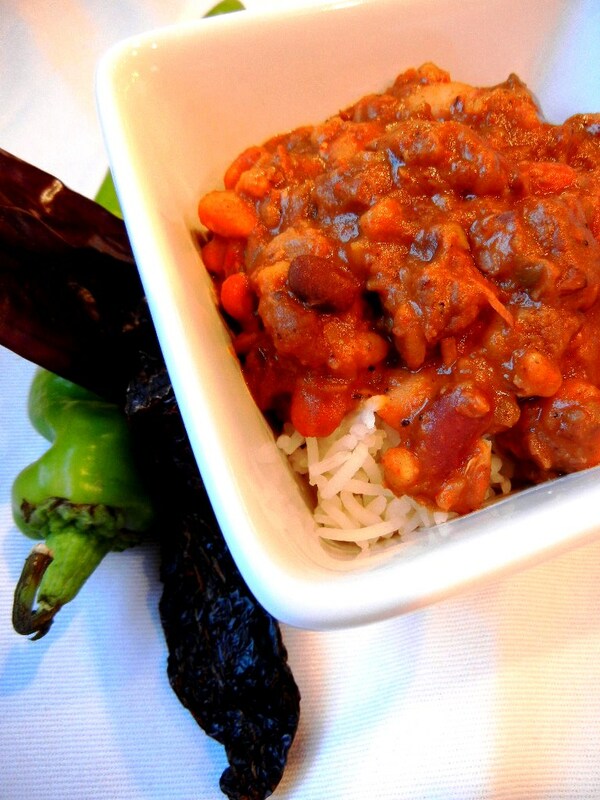 Chili is really not far off from a curry — its just a matter of how you look at it. Add in some local beer along with the water depending on where you live: Shiner Bock if you’re in Texas; a bottle of Columbus Brewing Company Pale Ale if you’re in Ohio. If you choose to add beans, think of perhaps adding a dried bean mix. Today I used Goya’s 16 bean mix. By all means let this concoction simmer for several hours, covered to keep in the moisture. This is a dish that develops over the day. Keep your spices and seasonings handy as an hour into the cooking will taste much different than three hours into it. Take your time and trust your palate. Adjust, adjust, adjust. Just before serving, you can add in a tablespoon or two of masa harina to thicken and add a bit more flavor. Serve over rice, if you like. I believe a Basmati for extra fragrance and interest does wonders. But remember, there are no rules when you’re making the house recipe. Playlist included Someday by Ceremony.